The average American lifespan is about 80 years. That’s about 29,000 days, give or take a few. You really only live once, but you can have pizza on any one of those days, so you have no excuse for not trying out some of the more “out there” pizza toppings. The best pizza is Chicago-style pizza. How do you take the best and make it even better? Throw these toppings on and get ready for an incredible experience. If you haven’t had artichoke hearts smothered in tasty cheese on top of your pizza, you’re seriously missing out. Romans and Greeks considered the artichoke to be an aphrodisiac. We’ll let you decide—but they sure taste good. “Eat your vegetables!” No, seriously. 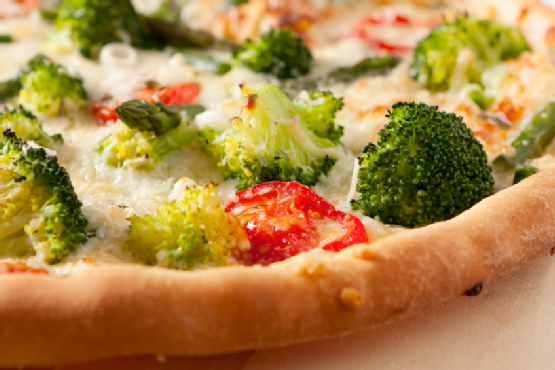 Throw some broccoli on top of a deep-dish pizza. It’s the best-tasting way to get those veggies down the hatch. This has to be tasted to be believed. It might sound strange, but if you’ve had pineapple on top of your pizza before, this won’t be that much of a stretch. The contrast between the sweet apricots and the tangy sauce is sublime. A kind of Portuguese sausage, this topping is a must for any meat-lover. Hearty and uniquely flavored with red chili and other distinctive tastes, make sure you’ve got some soda on hand to wash this down—or just sit back, and enjoy the burn. There are all kinds of mushrooms to put on your pizza, but shiitake mushrooms are also ridiculously awesome for your health. If you’ve got most of your days left to live, good for you—go get some Chicago-style deep dish at Pizza Chicago in San Jose and Palo Alto . Visit our website to see all the toppings we offer, give us a call to order, and we’ll keep our epic pizzas warm for you.